Mars, the God of War, is the ruler of Aries. In astrology, Mars is the planet of energy, action, and desire. It is the survival instinct, and can be thought of as the "leftover" animal nature of man. Mars rules our animal instincts for aggression, anger, and survival. Our sexual desires come under the rule of Mars. Whereas Venus rules romantic attraction, Mars is most associated with basic body attraction. This is the planet of action rather than reaction. With Mars, there is no contemplation before action. The drive associated with Mars differs from that of the Sun in that it is self-assertion rather than assertion of the will; it is raw energy rather than creative energy. Mars is the push that gets us out of bed in the morning, our drive and desire nature, and our active energy. When we are "acting out" our Mars, we are assertive, directed, forthright, and adventurous. On the negative side, we can be impulsive, rash, impatient, aggressive, and forceful. Mars is the action planet of the zodiac. The "Red Planet", after all, should be pretty fiery, and Mars does not disappoint. Energy, passion, drive and determination are all right up Mars’s alley. This planet commands you (and yes, Mars does rule the military) to stand up, be noticed and get things done - sitting on the sidelines belongs somewhere else in the heavens. Simply put, Mars speaks to the power and confident expression of the individual. Ambition and competition are also within Mars’s realm. 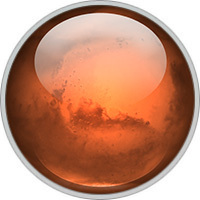 Whether it’s at work or on the field of play, Mars encourages us to face challenges and to be our best - or better. Aggression is part of the plan here, although Mars also values courage and honor. Assertion and a daring, fearless nature please this planet. It’s important to note that Mars’s energy can be constructive or destructive. The God of War in ancient times, Mars could be brutally violent. While this energy still emanates from the planet, it also asks us to harness this force for good. Stamina, ambition and achievement are all part of Mars’ mantra.